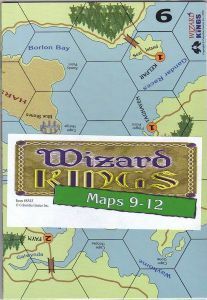 Maps 9-12 are compatible with all editions of Wizard Kings. Note that maps 9-12 all have a single land corner and can be joined into a large continent. Map 9 features a submerged Sea City. Only aquatic units can occupy this hex, although Flyers can fight there. The Blue Stones henge are nearby. Map 10 has a Walled City where defending units (only) have +1 Combat (B2=B3). The walled city is the key to this map. 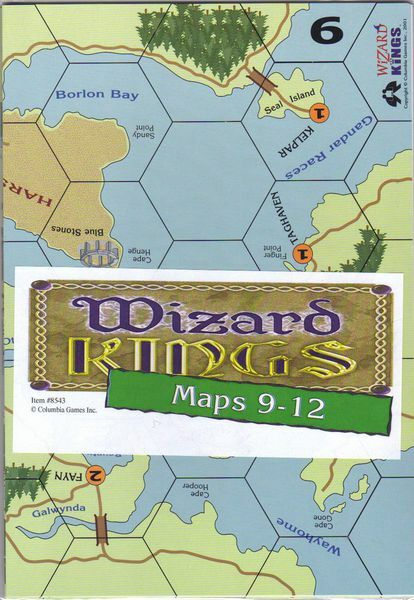 Wizard Kings is an exciting fantasy battle game with armies of elves, dwarves, orcs, undead, and three human armies (feudal, barbarian, amazon). Players customize their armies and fight for control of strategic cities and terrain on geomorphic maps. An expansion blockset for Wizard Kings. It contains 21 blocks: an assortment of 7 historical armies: Egyptians, Greeks, Persians, Romans, Huns, Chinese, and Japanese.